So, here is my latest drawing and it’s of my dog Lexi. She is a Golden Doodle which means she is a cross breed between a Golden Retriever and a Standard Poodle. She’s a really happy dog who loves everybody and everything. She’s a little nervous of traffic but is getting much better with practice. I’ve been wanting to draw her for a while but I was a little worried about white fur on white paper and so this is what I came up with. 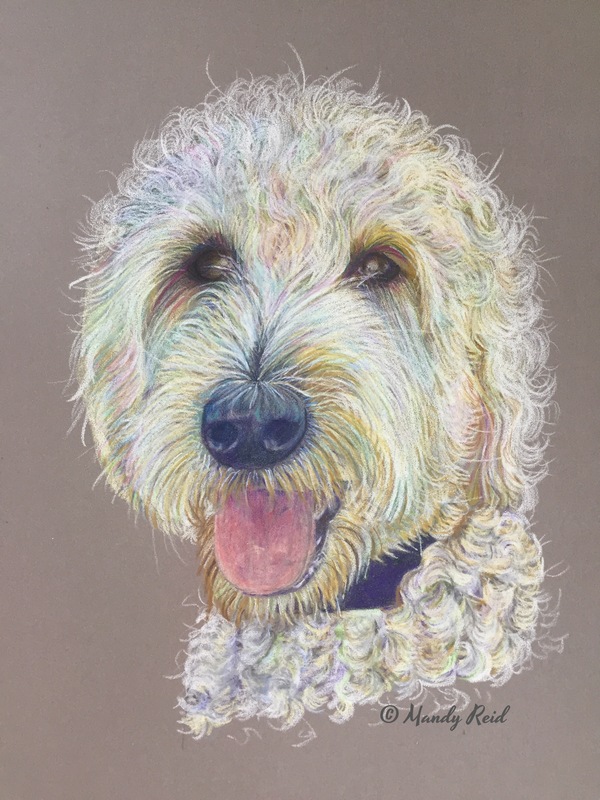 I’ve used a soft grey pastelmat paper and really highlighted all the reflected colours in her fur to keep up the interest. I’m very happy that I’ve managed to get her happy expression onto paper and I think I’ve ended up with a happy picture. Well, it makes me smile. I really like drawing animals so may stick to this theme with my next one too.